Kent Museum of the Moving Image played host to a Christmas Children’s Workshop on the Moving Image on Thursday 20th December, led by local teacher Lyn Faber (superbly dressed as Chief Elf) and ably assisted by the museum’s Associate Curator Julie Sumner, volunteer Jon Hunt, and Curator Joss Marsh (a sub-elf charged with bringing on the half-time refreshments). Children learned how to make thaumatropes (spinning discs), flick books, and strips for the zoetrope (“wheel of life”)—Victorian optical toys that seriously explored the phenomenon of “persistence of vision” which became the foundation of cinema, invented 1895. Spin the disk made by participant Natalie Starr, for example, which features knives and forks on one side, and a drawer on the other, and you see a complete cutlery drawer. Likewise, pre-digital films presented a series of still images, at a speed of somewhere between 16 and 24 frames a second: it was only in our minds that the still images ran together, to create “movies”. 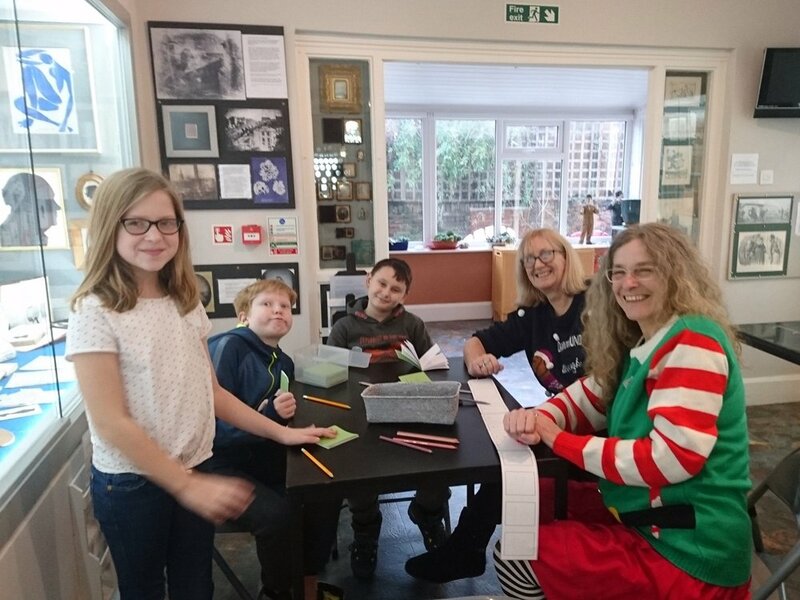 The workshop started with an I-Spy quiz around the gallery, and allowed children to play with and invent stories around a Christmas-themed miniature shadow-puppet theatre and a hand-shadow screen, where they could learn the art of “Shadowgraphy”. Cinema, after all, as the museum’s ground-floor exhibition explains, was the last great “Art of Light and Shadow”, which began c. 35,000 years ago with the first cave paintings, deep inside caves which could be illuminated only by the artificial—controllable—light of torches, fires, and oil lamps. “It was very enjoyable and really educational!” said Sue Morbey, grandmother of Natalie, brother George, and Logan Morbey. “It was a lot of fun”, agreed Jasper Sharp, father of participant Thorin Sharp, “and I’m proud of my Dancing Elf zoetrope!” “I’ve made a zoetrope strip of a red elf” (which worked!) “and two flick books” (which also worked! ), said Logan Morbey. But the finale took a lot of beating: “My favourite bit was when the grown-ups did the shadow pantomime” said another small participant. Workshop leader Lyn Faber concluded: “My favourite thing was seeing all the children enjoying the museum”. “Yes—it was wonderful to hear the children’s laughter”, agreed Curator Joss Marsh. “Fun is essential to learning, both for children and grown-ups. The Victorians understood this: it was by playing that they scientifically explored optical phenomena and laid the foundations for the visual entertainments we enjoy today”. The next dates for children’s workshops at Kent MOMI are: Thursday 21st February (half term) and Wednesday 17th April (Easter holidays). Check the events page of our website https://www.kentmomi.org/events for information, booking, and events/screenings. To enquire about group, school, or curated/tailored visits, contact the Curator: joss@kentmomi.org.